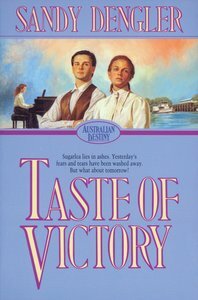 Taste of Victory returns to the turbulent story of Cole Sloan and Smantha Connolly which began in the bestselling Code of Honor. Sloan's sugar plantation lies in ashes, and both must seek a new future. Turn-of-the-century Australia presented them with many choices and both would seek success in the Riverina, the heart of the wool industry, agriculture and forestry in Victoria and New South Wales. Sloan uses the money he can salvage from Sugerlea to open up a brokerage. Investing other people's money with no personal risk promises to be lucrative, Samantha soon finds work as a clerical assistant to the dock master at Echuca, and becomes the real business manager behind the operation. Meanwhile Samantha's sister, Linnet, has found her way to the University of Adelaide where she develops her music. All goes well until Sloan tries to use his friendship with Samantha to work a good deal moving wool and timber, despite her refusal to compromise. The problems that erupt for each character will ultimately push them toward personal victory or defeat. Will it be the taste of victory? About "Taste of Victory (#03 in Australian Destiny Series)"